In a desperate public relations gambit today, HRP leaders Pat Saiki, Miriam Hellreich, Ted Liu, and Fritz Rohlfing steadfastly REFUSED TO DISPROVE the many substantive allegations of documented fraud uncovered by the Hawaii Republican Assembly (HIRA). A "special message" e-mail sent today from party headquarters on Kapiolani Boulevard tried to throw party members and the media off the scent of the highly suspect and scandalous closed door financial dealings of HRP's executive committee. 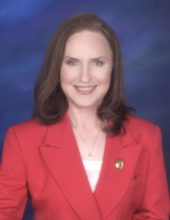 On behalf of Hellreich, Rohlfing and the corrupt leadership of HRP, immediate past state GOP chair Saiki RAGED about the "illusive, destructive, untruthful rantings of HIRA" while denying absolutely nothing about the fraudulent solicitations of party funds, the secret rule changes, the decision to allow mortgage funds to be used for anything other than the mortgage, the reportedly missing $80,000, and the persistent refusal by party leaders to allow an audit to be conducted. Saiki doubled-down with the wagon-circling by REFUSING to furnish party members with access to all financial books of the party, as well as DENYING access to secret minutes of meetings, secret budgets, etc. Rather than providing a single shred of evidence to disprove these documented allegations, party leaders demanded that members simply "trust them". This comes from the same Pat Saiki which recently demanded that "nobody should ever question me" when Republican challengers lost nearly every race in 2014. HIRA just heard from MAJOR party donor and influential Republican Mary Smart of Mililani. She was hoodwinked into buying a $2,500 table at the upcoming "mortgage" fundraiser for the "capital campaign". Ms. Smart recalls how she was promised that her money would be used ONLY for 'paying the mortgage'. The same FALSE PROMISE given to every other ticket buyer. What's worse is that Mary Smart distinctly remembers being lied to at the recent state convention, where she and everyone else in attendance was explicitly told that the new party rule was going to 'protect' that promise of 'monies donated for the mortgage'. Thanks to HIRA, Ms. Smart NOW knows that the rule was actually changed to secretly allow Hellreich, Rohlfing and Saiki to spend the money any way they want -- a completely opposite story from what Mary Smart and 150 other convention delegates were deceitfully promised over the microphone by party leaders. If secretive party leaders have nothing to hide, then why are they continuing to hide, obfuscate, spin, and lie in their desperate trampling of transparency? Why can't they be honest and forthcoming? This deception fuels mistrust and causes infighting. Now that they have put their own reputations on the line, why not come clean? What are they hiding? Well, you probably already know what they're hiding. 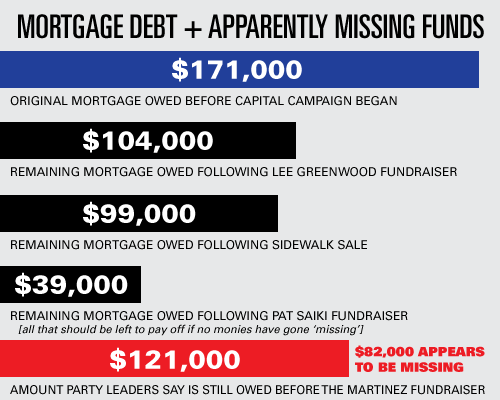 The fact is that party leaders do not want to tell you about the missing $80,000 from the mortgage fund because they don't have a good explanation. Remember, these are the same people who secretly funneled a controversial $120,000 compensation package of two years worth of salary and benefits and employee costs during a closed door meeting of the party's executive committee to pay Fritz Rohlfing's extremely inexperienced 'friend' to be on the party's payroll. And the integrity-challenged, politically-liberal Pat Saiki is the one who made the motion to cut the check to Rohlfing's friend on the heels of pushing for our party to be official neutral and silent on every single issue facing the people of Hawaii. It's NO WONDER they refuse to deny the allegations and resort to name-calling and more smoke and mirrors. If you read HIRA's recent Red Alert about this growing scandal , then you know the future of the GOP in Hawaii is hanging in the balance. foregoing party contributions until we have honest, principled leadership. When lies get told, promises go broken, and money goes missing, then it's time for Hawaii's Republicans to call for the current leadership to step aside. 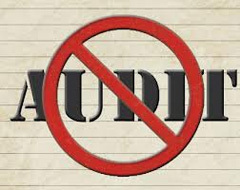 Join HIRA in calling for the removal of the complicit Executive Committee officers and for a full, complete accounting through an independent audit which is carried out in the light of day. It's bad enough that party leaders would see fit to embarrass the sitting governor of New Mexico with their phony fundraiser. But Republicans in Hawaii deserve to have a party of integrity which fights for what we believe in -- NOT a clone of the crooked Democrat machine that holds us back. There will NEVER be party unity as long as rampant corruption and unbridled liberalism plague our party. Protect yourself from fraud. Let's keep giving directly to candidates only. Let's not give a penny to this corrupt HRP organization until a fresh start can be realized. This series of financial scandals and legal problems call into question the fitness of HRP's current leadership. 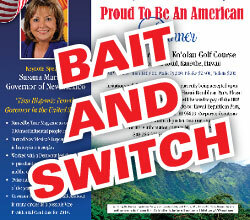 As this scandal escalates, few inside or outside the organization have faith in Hawaii's Republican Party when its own officers are actively duping donors and ticket buyers about a fraudulent "mortgage fund" and a bait and switch "capital campaign." Protect yourself against fraud and donate directly to Republican candidates until the corrupt party officers are gone and their scandals are cleaned up.